It is not usual practice to see a weight lifting belt coupled together with a few extra goodies in such an inexpensive combo package. The Rip Toned lifting belt however attempts at drawing in customers using their exhaustive descriptions and free goodies. This weight lifting belt features a contoured design with the front and back wider than the sides. This design adds extra support to the abdomen and back region while removing any inhibitions on the sides. The end result is comfortable fit with greater support. Overcoming plateau should now be easier than before. Rip Toned even managed to get 2014 World Champion Power Lifter, Kevin Weiss to endorse their product though I suggest not reading much into this. Professional athlete endorsements are all paid and I bet you, Kevin probably doesn’t even own a Rip Toned lifting belt! This belt uses solid metal clasp to rivet the Velcro strip through for secure fastening. It is completely washable and made with an inner core that is supportive and yet long lasting. Though Rip Toned offers an Abs and Low Carb Diet guide free, their USP is Lifetime No Hassle Free Replacement Guarantee. At such a low cost, this is the only brand that actively advertises their Lifetime Replacement offer. Available in total of five sizes, the variations in sizes are well spaced and because of the Velcro design, you can actually go for slightly smaller or larger size depending on your actual waist size. Remember, measurements for weight lifting belts should always be done around the midriff region and not along the waist. I just had to review the Rip Toned lifting belt. It has the most reviews on Amazon.com and is also the cheapest product currently available with 4.5 star plus rating! Yes, this inexpensive belt for some reason garners a lot of positive response and because it was cheap, I decided to buy it for my comprehensive weightlifting belt section. For starters, the Small size was perfect for my needs (as I have said many a times, I am a short person). However, the Velcro strap isn’t large so if you are uncertain of the size you need, I suggest getting one size larger. Good news though, when I called up the company to ask if I could replace my belt in case it doesn’t fit me, they replied with an enthusiastic “Yes”. Seems their customer service is pretty decent too. The belt itself is lightweight and nothing like Velcro weight lifting belts from other companies. It is, in my opinion, too light and does not feel rigid or sturdy enough to support your weight when doing deadlifts and heavy powerlifting. However, the design is great as a back support for almost every other exercise. Beginners will really love the belt considering how it is comfortable and supportive without being a hindrance in daily workouts. I can easily see myself wearing the belt under my clothing if I go out golfing or bowling. It isn’t massive like those sold in Home Depot and other places and yet supports your body weight better than most. The Velcro is of decent quality so you need not worry of the straps losing their grip. However, I do not feel confident trying heavy lifting with this belt. 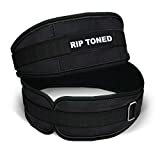 The Rip Toned lifting belt might be an excellent beginner friendly belt, but it lacks proper structure and rigidity necessary for any serious lifting techniques. My advice is to start with this belt if you do not have one yet and eventually get a leather or sturdier Velcro belt for powerlifting. At least, if your belt snaps or the Velcro loses its grip soon, you can get it replaced free of cost. Ideal for beginners and people with zero experience using a weight lifting belt. Comes with complete assurance of replacement regardless of the reason. Size of the actual belt isn’t massive or inhibiting. Contoured design helps ease the pressure on the sides and concentrates full support to the back and abdomen regions. Not rigid enough for powerlifting. Will eventually wear out over time, question is when? As far as inexpensive weight lifting belts go, the Rip Toned lifting belt ticks all the boxes. In fact, if it were a little more rigid and confidence inspiring, I would push it up my top ten list by at least two more places. Nevertheless, this is an excellent belt if you are limited by your budget, just beginning to lift heavy weights or need a daily back support that isn’t too constricting. Just don’t buy this belt solely because it has a few extra goodies packaged alongside or that the company offers free lifetime replacement guarantee.